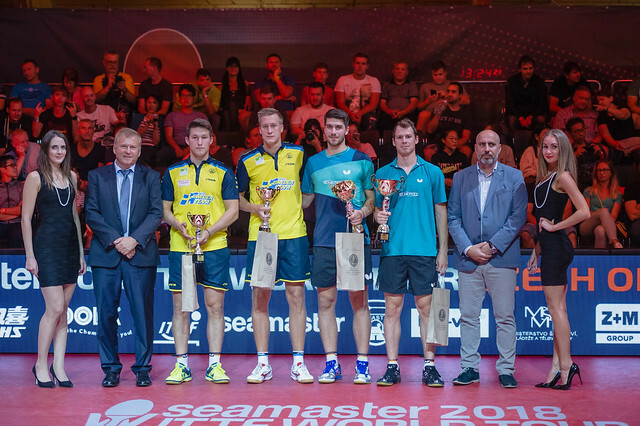 The top of the draw in the first round of the Men’s Singles event at the Seamaster 2018 ITTF World Tour Czech Open completed, no less than six seeds departed; immediately following, on the early evening of Thursday 23rd August, it was exactly the same scenario in the lower half of the first round Women’s Singles draw! Furthermore, the number was almost seven! Japan’s Mima Ito, the no.2 seed, facing a most testing opponent in the guise of China’s Zhang Rui, withstood a most spirited recovery before emerging successful by the minimal two point margin in the decisive seventh game (11-5, 11-9, 11-9, 7-11, 9-11, 7-11, 11-9). Progress for Mima Ito as status advised, it was the same for Poland’s Li Qian, the no.11 seed against an adversary in a rich vein of form and predicted to cause an upset. She beat China’s Wang Yidi (11-6, 11-9, 5-11, 5-11, 11-1, 12-10), the player who the previous week had reached the final in Bulgaria, losing to colleague, Ding Ning in a match decided in seven games. Success for the defensive skills of Li Qian but in the opening round of the Women’s Singles event, as play progressed, it was mixed fortunes for those who extolled the defensive art. Germany’s Sabine Winter, the fluent forehand most adroit against backspin play, caused the biggest upset of the round. She beat Japan’s Hitomi Sato, the no.4 seed (11-7, 8-11, 6-11, 11-8, 11-7, 11-4). Likewise, China’s Sun Mingyang proved her qualities when confronting defensive play; she ended the hopes of Han Ying, the no.14 seed and like Sabine Winter from Germany (9-11, 13-11, 12-10, 11-7, 8-11, 11-6). Defeats for defensively minded players; in addition to Li Qian, there was more success for the art. China’s Wu Yang, as so many times in the past, proved safe and secure. She beat Japan’s Hina Hayata, the no.5 seed (11-9, 11-6, 11-9, 12-10). Victory for Wu Yang contrary to seeding; it was the same for colleagues Wen Jia and Liu Gaoyang. One week ago in Bulgaria, Wen Jia had recovered from an opening game deficit to beat Romania’s Elizabeta Samara, the no.8 seed, in five games (8-11, 11-3, 12-10, 12-10, 12-10, 11-9); in Olomouc she did exactly the same (9-11, 11-7, 11-9, 11-2, 11-4). A five games win for Wen Jia, contrary to status, it was the similar for colleague, Liu Gaoyang; she beat Hungary’s Georgina Pota, the no.13 seed, in six games (11-9, 13-11, 3-11, 11-7, 10-12, 11-5). The end of the road for Hungary, it was also full stop for the host nation; Dana Cechova, the no.16 seed, was beaten by Portugal’s Fu Yu (11-6, 11-7, 11-7, 11-7). Play in the second round of the Women’s Singles event will be conducted in entirety on Friday 24th August.